There are no economic prerequisites or political grounds for the resignation of the current Cabinet of Ministers of Ukraine, and this is unacceptable one year before the presidential election, People’s Front Party leader Arseniy Yatsenyuk has said. “There will be no resignations of the Cabinet of Ministers. There are no economic prerequisites or political grounds for that. The issue of a report by the Cabinet of Ministers is raised exclusively for political motives, as it was raised when there was a political struggle against my Cabinet of Ministers,” Yatsenyuk told reporters on the sidelines of the 11th Kyiv Security Forum on Friday. The politician noted that the People’s Front faction has no questions to the government as a whole or to its members delegated to the Cabinet of Ministers from this political party. According to him, People’s Front representatives in the government are coping with their duties, and if partners from the Bloc of Petro Poroshenko party consider it necessary to change some ministers, then this is their right, and there is a respective procedure for this. 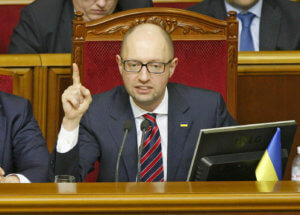 Yatsenyuk stressed that the resignation of the government was unacceptable one year before the presidential elections. “There must be stability in the country, so that a fair, transparent presidential election is held, so that the course of reforms continues in the country, and so that there are no signs of political destabilization,” he added.